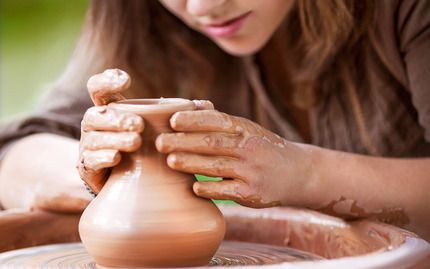 Not all pottery classes are all they're cracked up to be...but this one is the real deal! In this all-skill-levels class, you'll be taught how to make beautiful, handcrafted pieces using an authentic pottery wheel. Adding to the appeal, you'll work in a small class setting of no more than six fellow students, meaning you'll get lots of personalized attention tailored to your skill level to really hone your craft. As a bonus, you'll have the chance to create two completely finished pots to show off your hard work. In less words, this is a perfect way to learn the fundamentals of this soothing, creative outlet! It's gonna be "wheel" fun! Note: Additional firing/glazing costs are not included in this booking but can be easily paid for at the studio. Students must pick up glazed pots as soon as 2 weeks after class and no later than 4 months after class. I have been driving by this location for 2 1/2 years and I always thought it might be interesting but then ever take the time to set it up. Recently a friend of mine celebrate her birthday at this location and the owners/coordinators or so incredible that they made us feel like if the whole shop was ours.
. They truly have a passion for what they do and for the mission of their company. And it bleeds over to the way they treat the customers which is amazing. Looking forward to seeing the product of the items we made. Prices are very reasonable. Free parking and very convenient. Great for kids and adults of all ages. For families and team building too. AMAZING! Great spirited, enthusiastic teachers who know their stuff! Very affordable and would be great to throw a party there. I'm in their 5 week class and we are getting things done! Every class so far we are covering so much it feels great! I've always wanted to learn how to throw clay on a wheel and thought I would have to sign up for a community college course and I'm so glad I don't have to. The atmosphere here if fun, lively and well knowledgeable and we do sooooo many projects! If you want to learn how to throw clay fast this is your place, and of course you will have fun too! I had taken a pottery class in high school but couldn't throw very well on the wheel. After taking this class, I learned that the teacher makes all the difference. He was very patient and thorough and made sure we all (six of us in the class) got the technique right. I was able to throw three pieces in the allotted time. The glazing class was equally as good. I'm very happy with how my pieces came out. The studio is the best place for a beginner to learn the basics and more. My first pottery class! My friend and I took the Monday night class and are so excited, the class was amazing and we're super happy with how our pieces turned out! Will definitely be coming back for more classes and studio time! So happy we found a new hobby, just in time for the winter! Thanks!! Great class! I took my 11 year old daughter with me for our 1st pottery class ever and she is always asking when can we go back! It was a great deal and a lot of fun! Pottery is a lot harder than it looks though I will say that! Our instructor, Lauren (I think), was really fun and helpful! We will definitely go back!! I had a fabulous time with one of the best instructors I've ever had at an art class - and I taught art for 20+ years to college students. Lauren was amazing. In addition to making class fun and informative, she provided individual attention to each person throughout each phase of creating our pots. She was patient, had a sense of humor, was very encouraging. The place is organize, very delightfully decorated with colorful rooms and decals, and amazing Beatles paintings. I live far away and will go back. I was extremely impressed with Lauren and the entire business. Brava to Play with Clay! My sissy and I had great time. It's been 20 plus years since I've worked with clay. It was fun and not too difficult to learn or I should say relearn. Zena was our instructor and she made it easy to follow her. She helped make corrections and was always positive. It was a fun experience. Can't wait to go back and glaze our pieces. New studio is up graded a lot. Bigger space, nice facility and easy to park. Good service too!